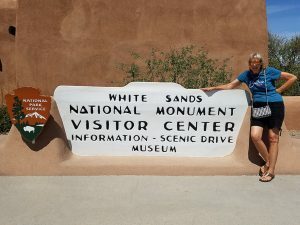 I strongly suggest that you call the visitor center at White Sands National Monument before you head out for a visit. We do not think to make that call and even though it is a lovely warm day in Las Cruces when we leave, heading east on Hwy 70 we begin to see the sky obliterated with white sand about 30 miles before we reach the park. This is probably not a good sign. Gusty winds increase in strength as we motor east and by the time we reach the park, winds there are gusting to 40 miles an hour. As we study the visitor center displays, we learn these winds help form and shape the park so are not unusual. The monument is like a huge beach surrounded by mountains instead of an ocean. Playing in this fine, powdery gypsum sand can be great fun so much so that we return the next day when the winds are less furious. A great place to take photos, have a picnic or roll in the sand, this park is small enough to enjoy in just a couple of hours yet packed with enough activities to linger all day. 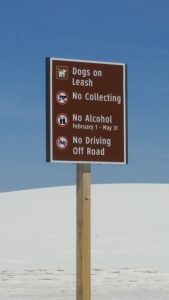 If you are planning a visit, please note the sign to the left and refrain from imbibing spirits in the park from February 28 – May 1. I ask the ranger at the gate “Why…?” (that is actually the only word I was able to utter before the ranger abruptly replied). He said only these 2 words, “Spring Break.” I can’t imagine what goes on here during spring break that made this sign necessary, but whatever it is we did not witness that sort of activity during our visit. When you view my report below please be aware that I misspoke about the sleds. You buy (not rent) the plastic sleds for $16 at the park gift shop. You can return the sled for a $5 refund when you leave the park so technically you can it rent for $11 or you can just bring your own plastic garbage can lid and save the $16 to de-sand-itize yourself. While you are east of Las Cruces you can also stop in at the White Sands Missile Range Museum and Missile Park. Be sure and check museum hours as well as the hours for the reception center through which you must be cleared before getting on the base to visit the museum and park. Wish we could share all the sights with everyone in person! Champions aren’t made in gyms. Champions are made from something they have deep inside them — a desire, a dream, a vision.